All-en! All-en! All-en! C'mon Brandon! If we trade up for Allen over the others this board will melt down! Rudolph at #74 nowhere near the top rated quarterbacks. you want the 4th best QB? Somewhere in rounds 3-4 seems right to me. I haven't looked at years past for Brandt... but does he often put this many QBs this high as it's relevant to all prospects? If this is indicative of the way most scouts rate these prospects regardless of position, then jesus, this is a top-heavy QB class. 3 of the 4 best players and 4 of the 7 best players in this draft, according to Brandt, are QBs. 5 QBs with legitimate 1st round grades. 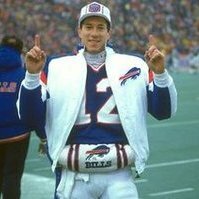 I just really hope Buffalo finds a way to get Mayfield, Darnold or Rosen... or passes on Allen and takes Jackson. man I’m looking forward to the epic melt down. I’ve got my pop corn ready. That is correct. if the bills draft 12th and it’s a choice between Rudolph and Rosen the Bills will take Rudolph. Bank on it. Gil has forgotten more football than you'll ever know. Octogenarian hate is a crime in every state. After the draft, and after they do the old “we got our guy” stuff.....what would you give for a peak at their REAL board?